A fantastic 4K HDR games console that has a full year ahead of any similarly capable rival. It would have been nice to have 4K Blu-ray playback and a larger hard drive, but PS4 games look distinctly better when played on a Pro and, for gamers, that's all that matters. Although Microsoft makes a song and dance about its powerful Xbox One X console, and justifiably so, it was Sony that beat its main rival to the 4K punch, with this, the PlayStation 4 Pro. It is capable of playing games with resolutions up to 4K and with high dynamic range visuals. 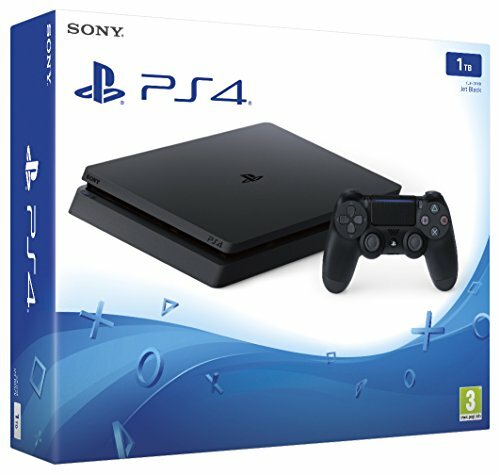 It is also considerably better specced than the standard PS4, so improves many gaming experiences and, even, the user interface - adding speed and smoothness to an already decent platform. But, with a major, albeit more expensive, direct rival now available, does to the PS4 Pro have enough to warrant your wonga? The answers to whether the Pro is worth considering over a standard PS4 really depends on what you want from your gaming and what home entertainment kit you have (or plan to buy). In more simple terms, if you don't have a TV capable of serving 4K resolution and high dynamic range (HDR) content and have no imminent plans to update, you really don't need the PS4 Pro. If, however, you are 4K HDR-ready then this is a formidable games console regardless of what they are doing over at Xbox. Although the PS4 Pro follows a similar design aesthetic to its smaller, slimmer brother, it is far from it in looks. Presumably to house the extra tech or, more accurately, the airflow required to dissipate the heat they'll generate, the Pro is massive. It's even considerably bigger than the original launch PlayStation 4. PlayStation players used to poke fun at their original Xbox One owning peers, citing that it looked like a Betamax player from the 80s. Now Microsoft fans can get their own back. Not only are the Xbox One S and Xbox One X small and sleek these days, the Pro looks like it's not just been beaten by the ugly stick, it's been shot in the face by the ugly shotgun and run over by the ugly steamroller. The sandwich-style, three deck casing does nothing to hide its girth and the only blessing is that it can lurk in a TV cabinet, mostly hidden thanks to the matte black finish. We do like the light strip around the front, to show what mode the console is in – which is missing on the standard PS4 – and the latest DualShock 4 comes bundled, the one with the additional light bar on the touchpad. But it's what's inside that really counts. The Pro's appeal is in its components – and although it has been surpassed by the One X in more recent times, the internal tech makes a massive difference for what you can get out of it. As we've said above, the Pro isn't as powerful as the Xbox One X in spec terms, although it is roughly £100 cheaper and trounces anything else on the market. The Pro's CPU is similar to that in the standard PS4, but has been clocked at 2.1GHz (over the PS4's 1.6GHz) so is around a third faster. The RAM is also faster - there is 8GB of GDDR5 RAM, as before, but it had a bandwidth of 218GB/s. There's also an additional 1GB RAM for system applications to not interfere. That allows develops to use more oomph during processes. Finally, and most significantly, the graphics processing is seriously upgraded. The new AMD Radeon GPU has 4.20 teraflops to play with – considerably more than double the power of the graphics chipset in the standard PS4. That's what drives the PS4 Pro's headline features and its main raison d'être. This is a console entirely designed for higher fidelity graphics and better image representation full stop. It plays the exact same games as any other PlayStation 4, with exactly the same user interface and control system, but it runs them better. That's because it is capable of presenting a game's graphics in 4K – not always native 4K, as we'll explain in a bit, but up to the required 2160p to make the most of your shiny new 4K TV. More importantly, perhaps, is that it does so with high dynamic range (HDR) picture tech and the combination of higher resolutions, brightness and a much wider colour gamut makes for some stunning visuals. There are many games that have been patched to offer enhanced graphics for PS4 Pro and the difference in quality is palpable. Plenty of PS4 games now make use of both 4K and HDR. And some have other benefits afforded by the extra power. Different developers utilise the extended technical abilities in different ways. You even get different options in the same games. For example, you can play some titles in 4K at 30 frames per second or opt to stick to the original 1080p at a higher frame rate of 60fps. The latter is smoother, but the former is crisper and has more detail. The HDR element is generally constant regardless. HDR is arguably an even better tech than 4K, in terms of visual impact. Most games we've seen with HDR enabled look stunning. They use lighting effects beautifully and if you have a TV capable of displaying both the wider colourfield and higher brightness, game graphics with HDR often explode with colour and tingle the back of your eyes. It's worth noting that other PS4 hardware (i.e. not the Pro) is also capable of HDR presentation. But these earlier consoles can't throw the extra detail into the mix, nor the extra frame rate. That's where the PS4 Pro comes into its own. Of course, considering the GPU isn't as powerful as a 4K PC graphics card (which will set you back much more than the entire Pro) developers invariably cut a few corners when rendering at ultra high-def resolutions. Many games use checkerboard 4K rendering which is better than upscaling, but not quite native. A full Ultra HD resolution (3840 x 2160) contains almost 8.3-million pixels, almost four times as much as the 2.07-million displayed by a 1080p TV. To render every single pixel independently, the amount of data flowing through the processors would be enormous. Instead, developers can cleverly utilise checkboard 4K rendering, which takes a small 2x2 block of pixels and extrapolates it to a 4x4 equivalent, thereby upscaling the image but adding extra detail in the process. There are several native 4K games, such as The Last of Us Remastered, but many adopt dynamic scaling systems. Once developers have even more time with the Pro, the enhancements to their games will become more pronounced. All we know for now is that plenty of publishers and studios are keen to further exploit the machine, even after it has been around for a while. And that's great news for those looking for an ideal companion for their 4K HDR telly. PlayStation VR is another beneficiary to the extra processing power on offer. Rather than add HDR or 4K resolutions, neither of which are displayable on the headset, virtual reality developers can up the frame rates of the games, improve in-game draw distances or details, or generally enhance textures. We played Farpoint on a PS4 Pro, for example, and it looks better than the standard version. Less positive is how the PS4 Pro works as a media player. You get Netflix and Amazon Video is 4K - with HDR support on the former - and that's great, but there's less good news about 4K Blu-ray playback. We're sorry to say that the PS4 Pro is not capable of playing 4K Ultra HD Blu-rays at all. Not only is this baffling considering Sony is a main driver of 4K video content and was a big proponent of the new disc format at launch, it hands a considerable advantage to the console's current major rivals, the Xbox One S and One X. Those looking for a great all-round 4K machine will probably plump for one of those instead. As we're handing out negatives, we're also dismayed that Sony settled on a 1TB hard drive for its Pro console edition. Considering many games are weighing in at over 60GB these days, and more with 4K updates, you'll soon fill your drive. You could only store around 16 triple-A games on it, for example. Indeed, we upgraded our drive for a 2TB 2.5-inch Samsung equivalent – currently around £90 on Amazon. Thankfully, the process to swap drives is quick and simple, the longest part is downloading and reinstalling the system software. But surely for a true pro gamer machine you'd want the very best already in place? Caveats aside, there is absolutely no doubt that the PlayStation 4 Pro is the best PlayStation we've ever been treated to. Its graphical nous is on a par with the more expensive Xbox One X (most of the time) and developers are seemingly more than happy to support it. We wouldn't imagine anyone without a capable 4K HDR TV will be that interested, although you do get some benefit when plugged into a standard 1080p telly - images do look sharper. But if you're really dedicated to your gaming, it might be worth updating your set anyway. And if you do, the PS4 Pro is the console to match it with. Just keep an extra space in your AV cabinet for a 4K Blu-ray player too.